Dr. Andrew Watkins has been passionate about understanding the world around him his whole life. After growing up in central Victoria and then the Mornington Peninsula, he attended The University of Melbourne where he majored in meteorology. His first taste of climate research came in 1992 with a stint in the Solomon Islands assisting the US NOAA 'Hurricane Hunter' aircraft as part of the TOGA COARE research project into the El Nino-Southern Oscillation (ENSO). His later PhD on sea ice and its influence on Antarctic weather and climate opened the door to visit the most southern continent twice, as well as introducing him to the complexities of using, modifying and analysing dynamical climate models. For his post-doc he joined the Co-Operative Research Centre for Southern Hemisphere Meteorology at Monash University, researching decadal climate cycles and ways to better initialise weather forecast models. 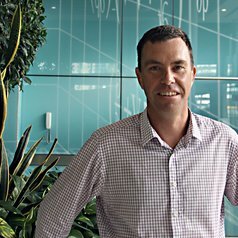 Since joining the Bureau of Meteorology in 1999 he has been involved in many projects developing new climate products, becoming the Bureau's Manager of Climate Prediction Services in 2012, responsible for delivering seasonal climate outlooks and determining current and future ENSO status. In this role he has recognised the importance of matching best science with user needs using great communication. In more recent times this has meant appearing in regular climate segments on ABC-TV's Landline and News Breakfast programs. pushing forward with social media, and of course writing for The Conversation. Andrew has served on several U.N World Meteorological Organization (WMO) expert teams on climate matters, is a key contributor to WMO ENSO Statements, and is currently a WMO advisor on Social Media. He has been a co-editor of the annual Bulletin of the American Meteorological Society's Status of the Climate reports, and was editor, then editor-in-chief, of the Bulletin of the Australian Meteorological and Oceanographic Society.